Begin your day with a cup of coffee. Early morning game drive along Kasenyi and Queens Mile makes visitors encounter elephants, buffalo, water bucks, warthogs, lions, Uganda Kobs lakes and a variety of birds. Return to the lodge for breakfast and lunch. After lunch, a two hour boat trip along the famous Kazinga channel is worthwhile an opportunity to see Hippo, Bufallo, Kobs, Elephants, warthogs etc. This trip also enables visitor chance to see spectacular birds. Dinner and overnight at Mweya safari lodge. 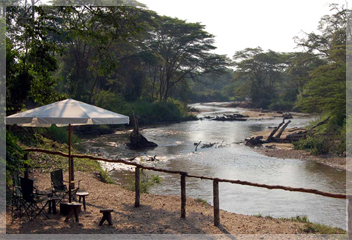 Ihamba Safari lodge or Mweya hostels. Meal plan: Breakfast, Lunch and dinner. With previous days memories, enjoy your breakfast ready for guided primate walk along Kyambura Gorge to look for habituated chimps through the gorge. After primate walk, drive to Mbarara for lunch. Return to Kampala at your own convenience where you will be dropped either to your hotel/residence or airport. Below in the table is the inclusive cost for 3 days Queen Elizabeth Safari Per person respectively. You'll be personally met arrival at Entebbe airport, and transferred to your accommodation. Dinner and overnight at Lake Victoria Hotel (Luxury accommodation), Cassia Lodge (Medium Accommodation) or Entebbe Guest House (Budget accommodation) Meal Plan: Dinner. Our driver/guide picks you from your hotel of residence at 8:00 a.m. Drive to Mbarara (283km from Kampala) via Masaka. Make a first stop over at Equator crossing for snacks and photography. Lunch break is made at Regency Hotel or Agip Motel Mbarara. After lunch, drive to Bwindi. This is the lushest highland rain forest on earth, filled with primates and exotic birds, valleys, hilltops and papyrus swamps. The afternoon is spent on a foot safari around the local communities living around the park. Meals and overnight at any of the following recommended accommodation: Gorilla Forest Camp, (High end/luxurious accommodation) Engagi Lodge, (Medium class accommodation) and Buhoma local community Bandas (Low budget/basic accommodation). Begin the day with breakfast ready for trekking, which begins at 8:00 a.m with a briefing from the UWA staff. Ensure to carry along with you rain jacket, drinking water, snacks, jungle boots etc The guides will lead you inside the jungle to see the shy Primates for a group you have been booked for. 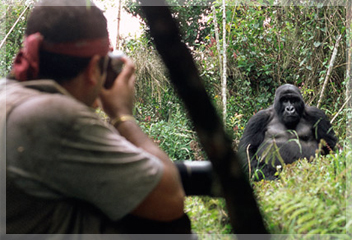 Do not forget to take your lunch boxes and all the necessary gear to track the rare Mountain Gorilla, perhaps one of the most exciting wildlife experiences on earth. The tracking may take between 2 and 6 hours but its well worth the effort. Meals and overnight at any of the following recommended accommodation: Gorilla Forest Camp, (High end/luxurious accommodation) Engagi Lodge, (Medium class accommodation) and Buhoma local community Bandas (Low budget/basic accommodation). Return to Kampala, then Entebbe, with lunch enroute and stop over at Equator Uganda before your evening departures home. End of services. The Safari begins from Kampala/ Entebbe. Our guide picks you at 7:30 am from your hotel or residence, drives to Mbarara (283 Km from Kampala) westwards via Masaka. Make the first stop over at Equator crossing for snacks and photography. Lunch break is made at Regency Lake view Hotel or Agip Motel Mbarara. After lunch, a drive to Queen enables visitors to enjoy beautiful scenery, herds of long horned Ankole cattle, tea plantations in Ishaka, Rift valley escarpment, open grassland and woodland savanna. Evening game drive for sightseeing is much more rewarding. Dinner and overnight at Mweya safari lodge. Ihamba Safari lodge or Mweya hostels. Meal plan: Lunch and dinner. Today's drive is through what is probably East Africa’s most spectacular scenery, the highland rain forests which reach to the volcanoes in which live the mountain gorillas. A glance of Kyambura gorge is a must! 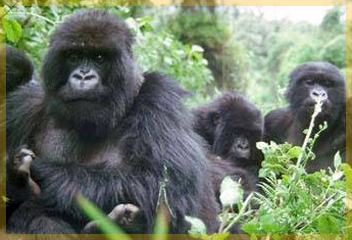 Make a game drive at Ishasha on your way to Bwindi in search of the tree climbing lions. Later, drive to Bwindi via the beautiful scenery of the tea plantations. This is the lushest highland rain forest on earth, filled with primates and exotic birds. The afternoon is spent on a foot safari around the local communities living around the park. Meals and overnight at any of the following recommended accommodation: Gorilla Forest Camp, (High end/luxurious accommodation) Engagi Lodge, (Medium class accommodation) and Buhoma local community Bandas (Low budget/basic accommodation). Begin the day with breakfast ready for trekking, which begins at 8:00 a.m with a briefing from the UWA staff. Ensure to carry along with you rain jacket, drinking water, snacks, jungle boots etc The guides will lead you inside the jungle to see the shy Primates for a group you have been booked for. Do not forget to take your lunch boxes and all the necessary gear to track the rare Mountain Gorilla, perhaps one of the most exciting wildlife experiences on earth. There are now only 650 left in the world! The tracking may take between 2 and 6 hours but its well worth the effort. . Meals and overnight at any of the following recommended accommodation: Gorilla Forest Camp, (High end/luxurious accommodation) Engagi Lodge, (Medium class accommodation) and Buhoma local community Bandas (Low budget/basic accommodation). Return to Kampala, then Entebbe, with lunch enroute and stop over at Equator Uganda before your evening departures home. Meal plan :( B, L) End of services.